This series of Bill of Rights pictures will show you some of the interesting history of the American Bill of Rights. 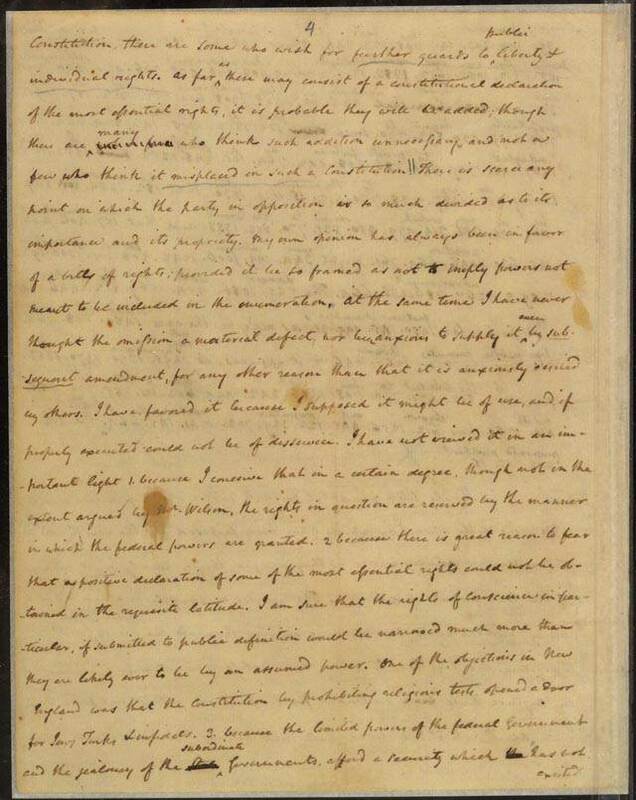 From letters of James Madison, George Washington and Thomas Jefferson, you can see and read about the various arguments that were fought over the inclusion of the Bill of Rights in the US Constitution. 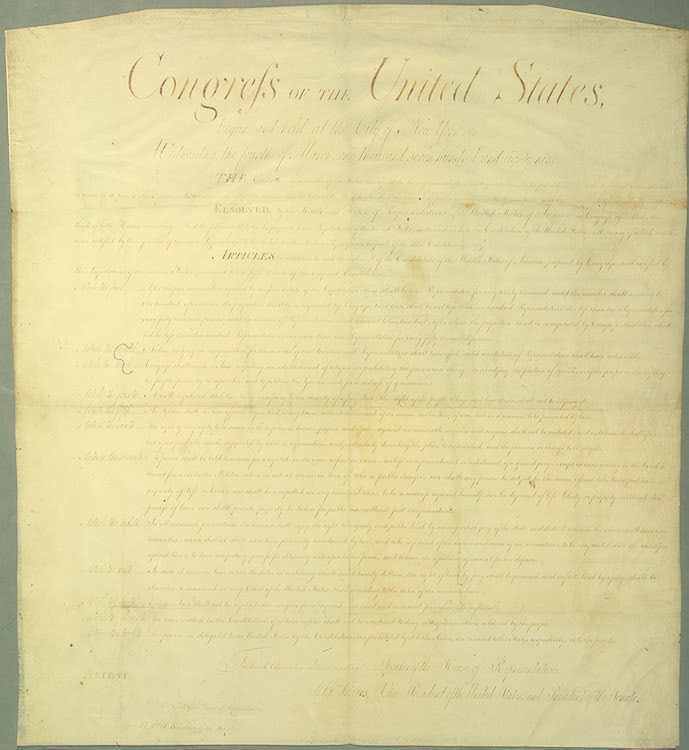 These Bill of Rights pictures also include pictures of the original documents printed by Congress, as well as the handwritten notes James Madison used when he presented his Twelve Amendments to Congress (there were twelve originally). These pictures are listed in chronological order so you get a good lesson in the history of the Bill of Rights by reading through them. 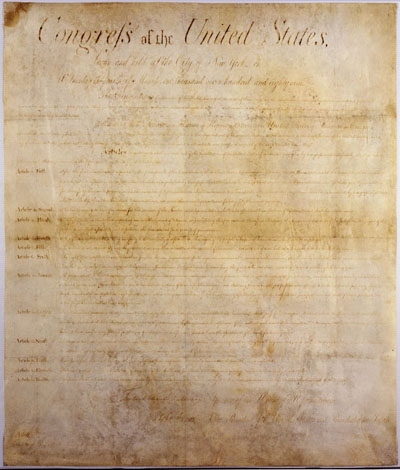 Today you can see an original copy of the Bill of Rights in the Rotunda for the Charters of Freedom at the National Archives in Washington DC, along with the original Declaration of Independence and the original Constitution of the United States. You can visit the National Archives Website here for information about visiting the Archives. 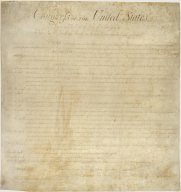 The next time you are near Washington DC you can go and see the original Bill of Rights. The Bill of Rights is in the case to the right in the picture. 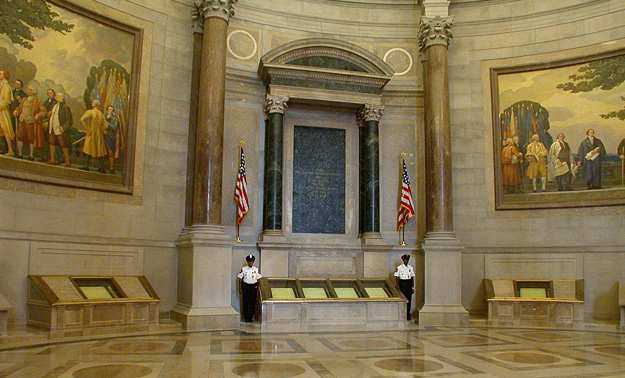 You can also see the original Declaration of Independence, which is in the case to the left and the 4 pages of the original US Constitution, which are in the case between the guards. For a really cool 360 degree view of the Rotunda, click here. 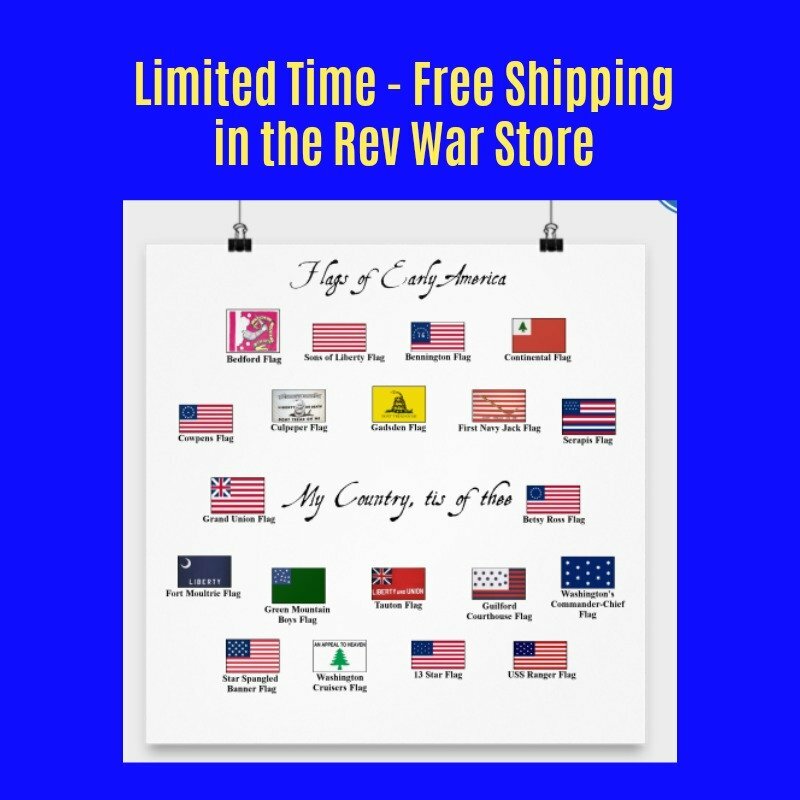 The first picture in this series of Bill of Rights pictures is a picture of a letter that George Washington wrote to his friend the Marquis de Lafayette in 1788. Marquis is a French title of nobility, similar to a duke, earl or baron. The Marquis de Lafayette had become friends with Washington during the Revolutionary War. Many French soldiers had participated in the American War of Independence and Lafayette was a top general that Washington depended on. They eventually had almost a father-son relationship and they kept in frequent contact after the war. 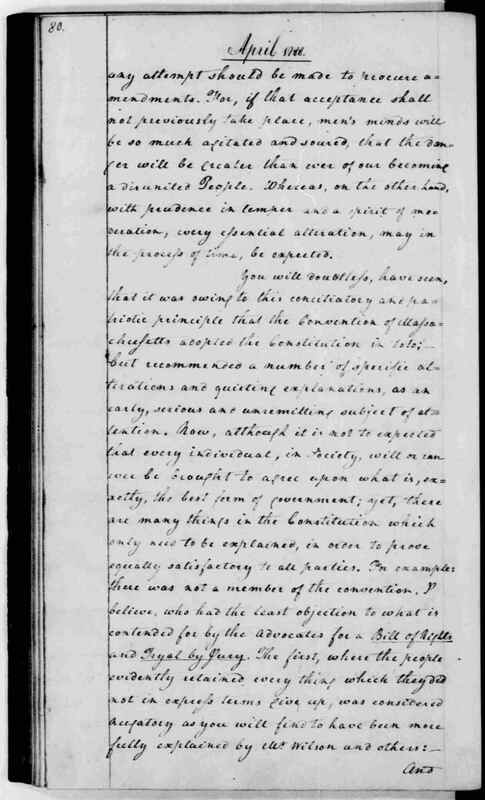 In this letter, Washington discusses the Constitution which at that time had only been ratified by five states. He was waiting to see whether or not the document they had worked so hard on would in fact become the law of the land. He also discusses the calls of many for amendments to the Constitution, or a Bill of Rights, that would specify rights given to the people that were not mentioned in the Constitution. 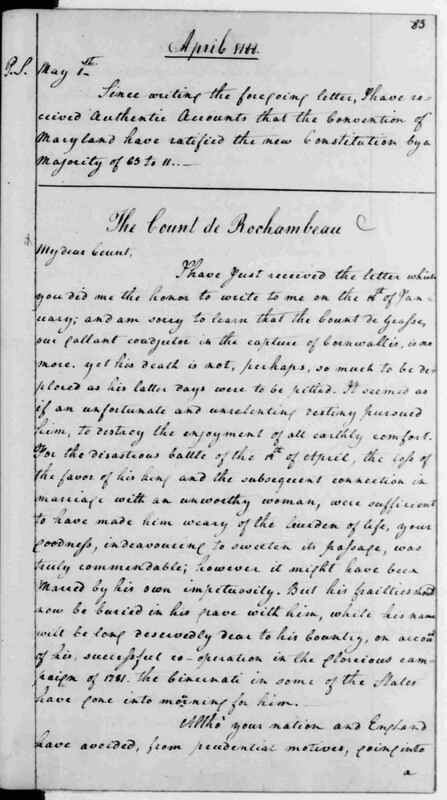 You can read Washington's letter to the Marquis de Lafayette here. 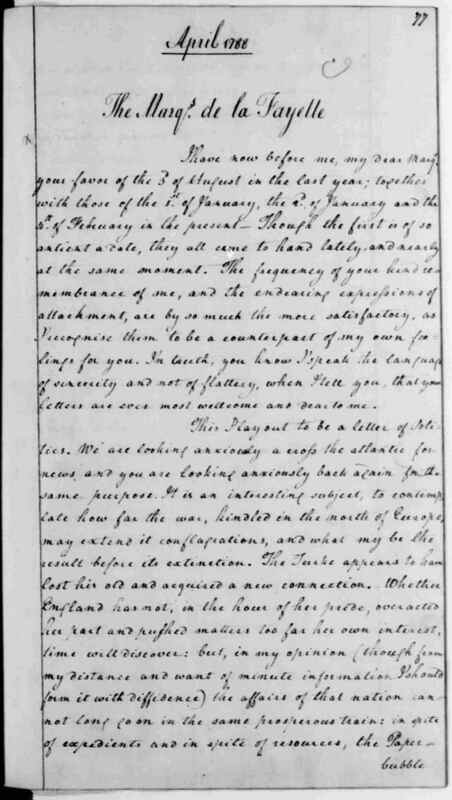 This is a picture of a letter James Madison wrote to Thomas Jefferson in October, 1788. At this time, they were anxiously waiting to see whether or not all the states would accept the Constitution as their ruling document. Several states had already accepted it but now there was a vigorous public debate about whether or not the Constitution adequately safeguarded the people's rights or if it gave the government too much power. Some people were calling for a Bill of Rights to be added to the Constitution if they were to be persuaded to accept it. In this letter, Madison discusses some of the pros and cons of adding a Bill of Rights. 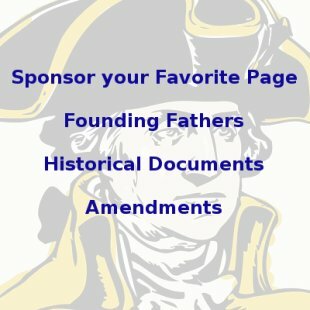 What cons could there be against adding a Bill of Rights? Madison was concerned that if they started trying to adjust the Constitution, some would have it adjusted so much that its power would be undermined and the government would be too weak to function, as it had been under the Articles of Confederation. Another interesting fact about this letter is that it was written in cipher, or a code used between two parties to ensure that if the letter fell into someone else's hands, they wouldn't be able to decipher it. 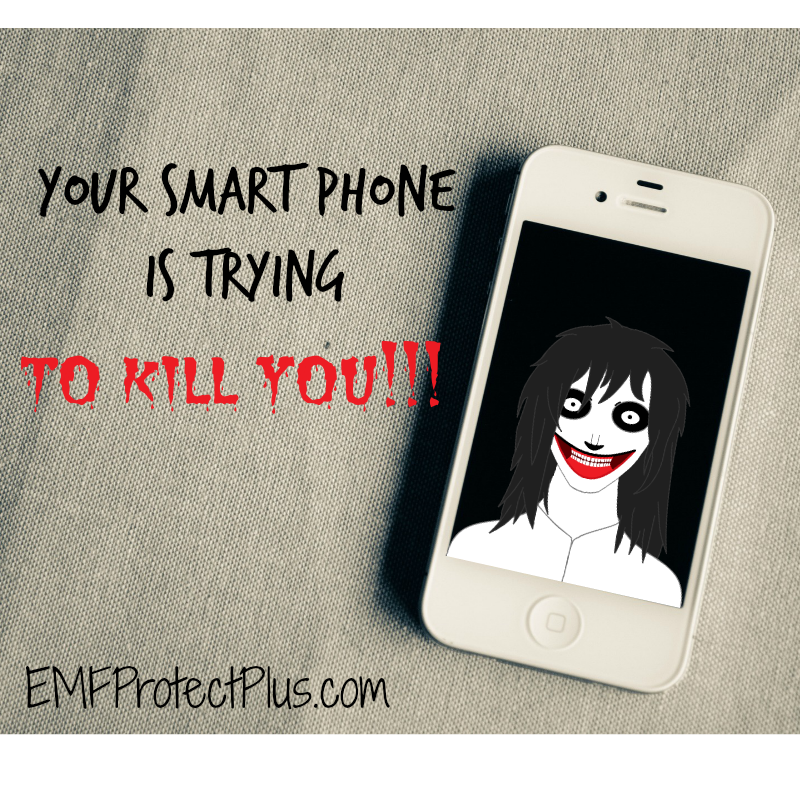 The sender and the receiver each knew the code so they could decipher the letter. 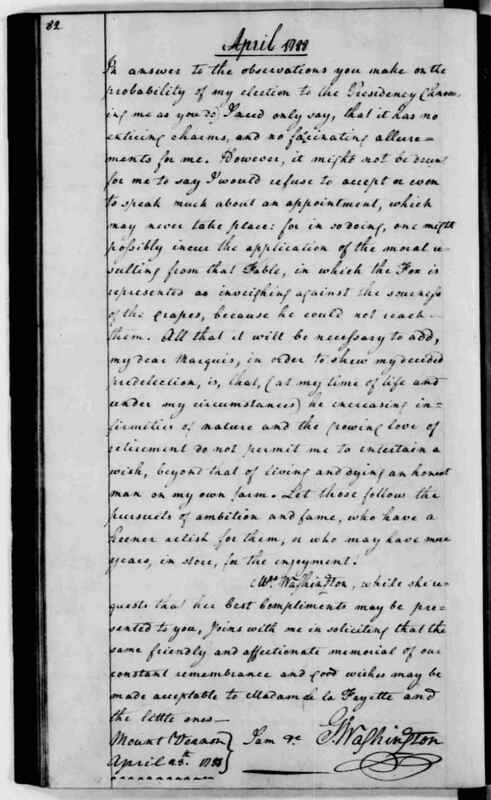 You can read James Madison's letter to Thomas Jefferson here. This is one of the more interesting Bill of Rights pictures. 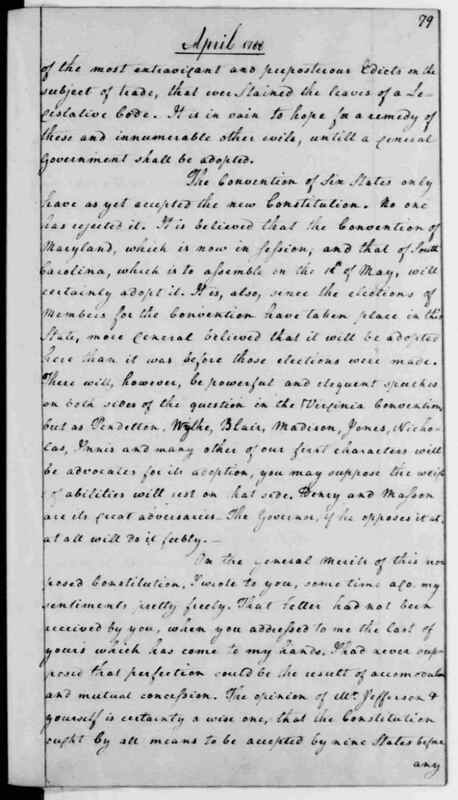 On June 8, 1789, James Madison gave a famous speech in the House of Representatives calling for a list of amendments to be added to the Constitution. Madison did not personally believe a Bill of Rights was necessary to secure individual rights, but called for one nonetheless because many people would not support the Constitution without one. He had also promised his own constituency back home that he would press for amendments. They wouldn't have voted for him if he hadn't! 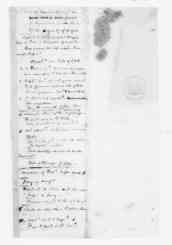 This is a picture of the handwritten notes that Madison used while giving this famous speech. In it he called for twenty amendments to the Constitution. He didn't actually call for a Bill of Rights in the form of a list added to the end of the Constitution. He called for the changes to be placed right into the text. Even so, the Congress pared the list down to twelve and stuck them at the end. Later the states only ratified ten of the amendments, thus the reason they are called the Ten Amendments. 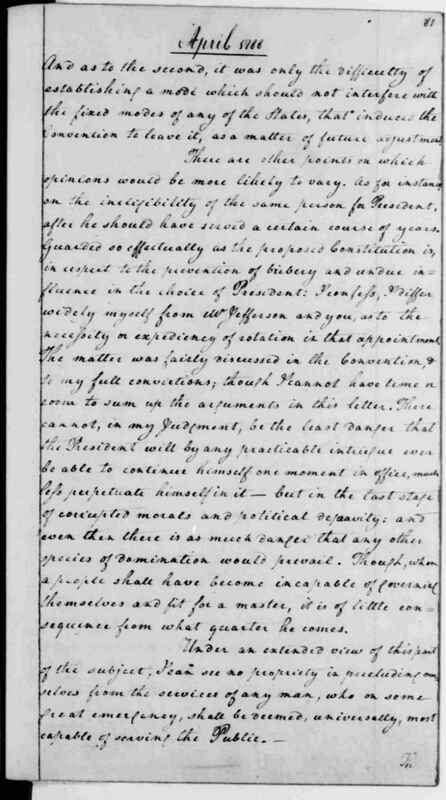 You can read James Madison's speech here. It's not too long and it's pretty interesting. Bill of Rights Pictures - The Seventeen Amendments! 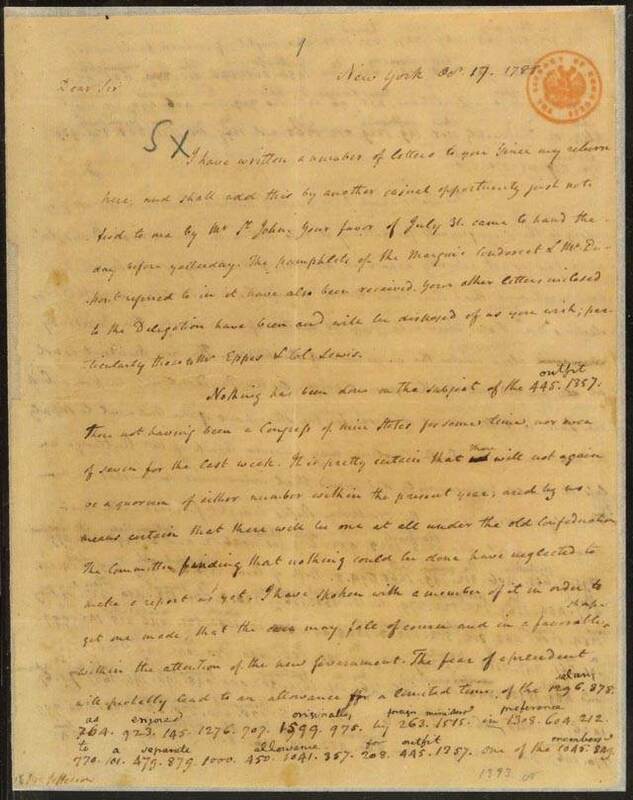 After James Madison's June 8 speech, the House waited about six weeks before discussing his proposals for amendments. After throwing some out, reworking others and rearranging their order, the House approved seventeen amendments on August 24, 1789. Then the Senate took up their bill and pared the list down to twelve. 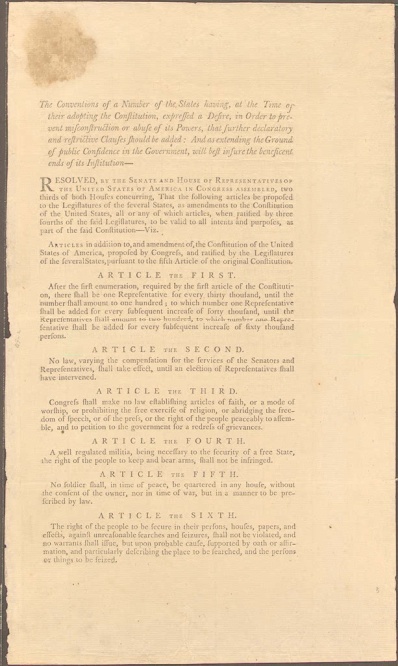 After that a joint committee of both houses finalized the wording and produced the final copy on September 25, 1789. Later the states voted to ratify only Ten Amendments. 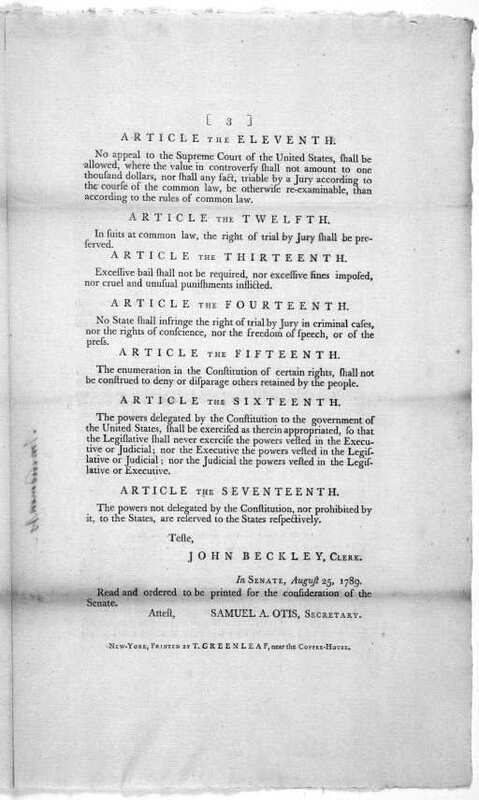 On September 14, 1789, the Congress printed up some preliminary copies of the Bill of Rights for internal use. There are only three known existing copies of this preliminary printing. This copy belonged to James Madison. 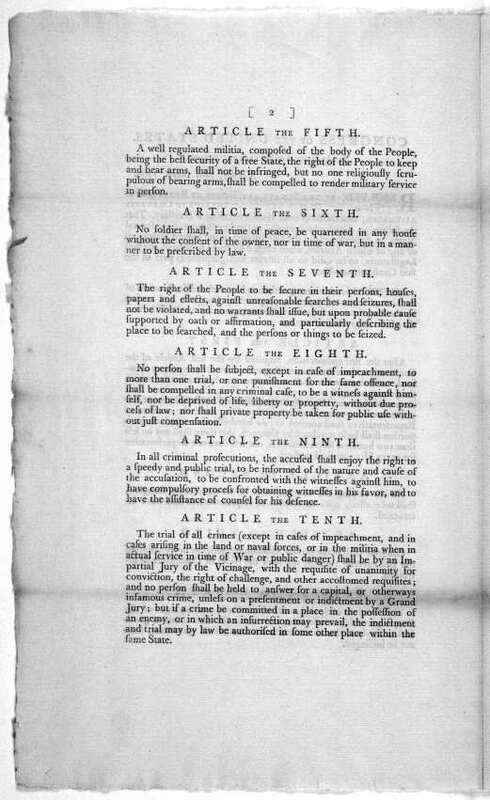 This is the original Bill of Rights. This is the copy printed by Congress for submission to the states. It was penned by William Lambert who was a congressional clerk at the time of the Bill of Rights. President George Washington had thirteen handwritten copies transcribed from this one and sent them to the governors of each state. 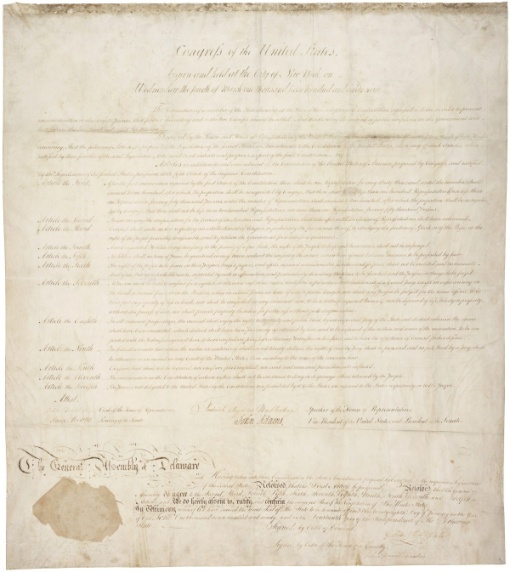 This original copy is the one that is on display in the Rotunda for the Charters of Freedom at the National Archives in Washington DC. Click here to find out about visiting the Archives. On September 25, 1789, the Congress voted to approve Twelve Amendments to the Constitution. They printed up a copy for each of the thirteen states and one for themselves. 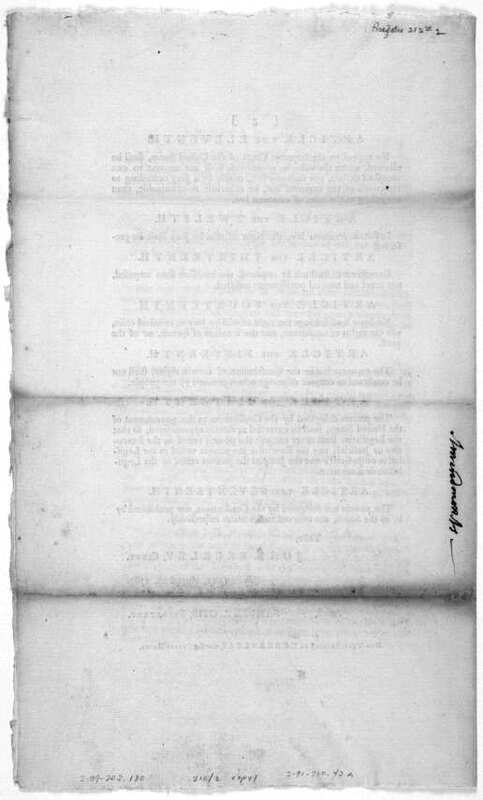 President George Washington then sent each state its copy. 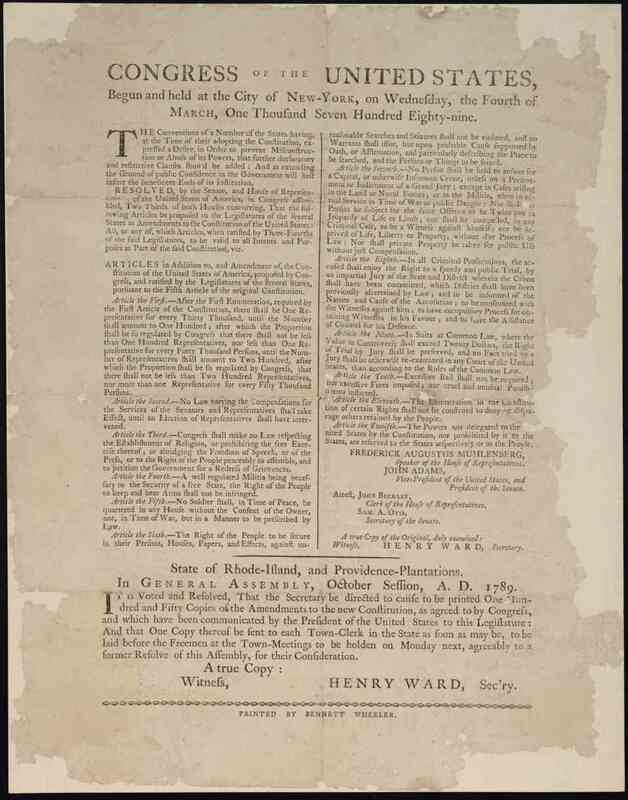 When the government of Rhode Island received its copy, it immediately had multiple copies printed up which were sent to the various towns around the state, so people could look at them and decide what they thought. This is a picture of one of those copies. This is one of the more interesting of these Bill of Rights pictures. During the Civil War, North Carolina's original copy of the Bill of Rights was stolen by a Union soldier and taken to Ohio. It changed hands a few times and was offered for sale back to North Carolina at various times, but North Carolina always refused to pay for stolen state property. 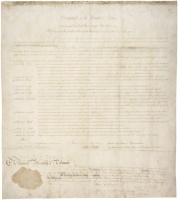 This copy of the Bill of Rights was valued at $30 to $40 million dollars. In 2003, the document surfaced again. North Carolina was able to recover the document with the help of undercover agents, handwriting experts and an FBI sting operation! This is a picture of the actual copy which actually measures about 3 feet tall by 2 feet wide. 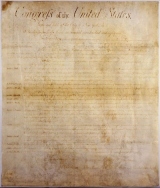 This is a picture of the Original Bill of Rights sent to the state of Virginia by President George Washington on behalf of Congress on September 28, 1789. Congress printed fourteen copies all together, one for each state and one for itself. 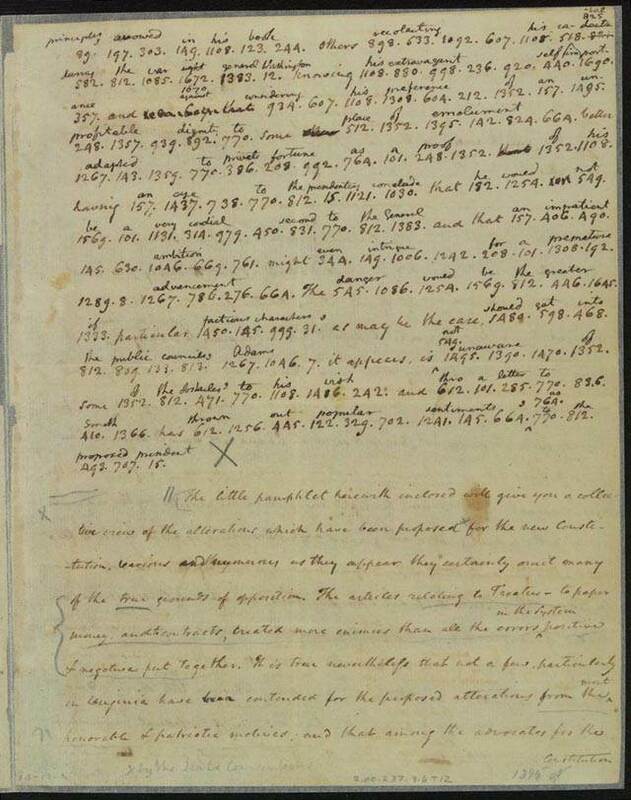 The copies are all signed by Frederick Augustus Muhlenburg, who was the first Speaker of the House of Representatives, and John Adams, who, as Vice President, at the time, was the head of the Senate. 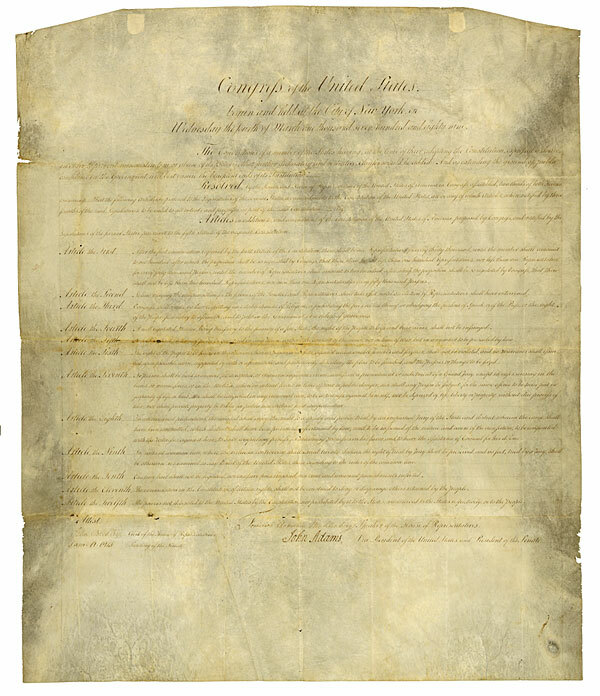 Delaware's copy of the Bill of Rights was in the possession of the Federal Government for over 200 years. 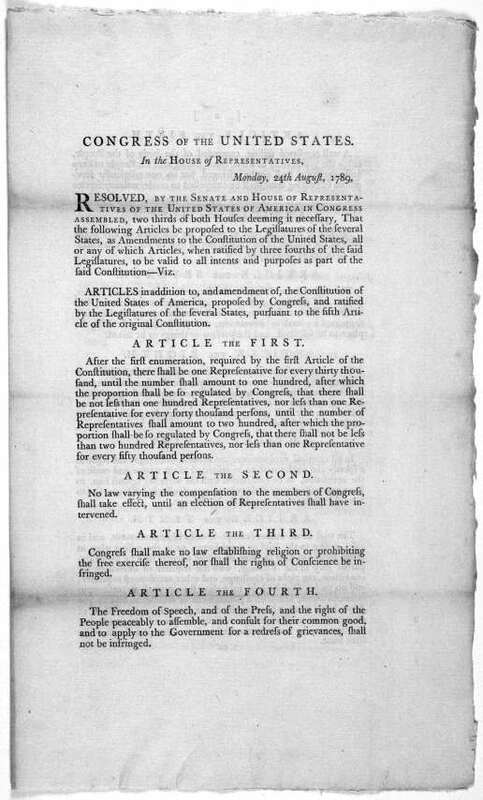 All of the states except Delaware signed separate documents indicating their acceptance of the Bill of Rights that were sent to Congress. 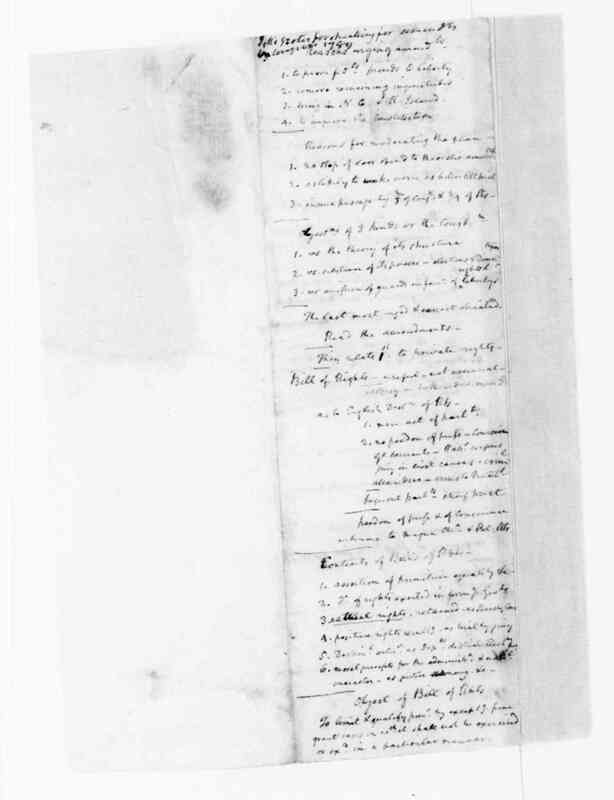 Delaware, on the other hand, wrote its acceptance on the bottom of the original document and sent it back to Congress. It remained in Federal possession until recently when an agreement was made with the state of Delaware to display it periodically in the state. 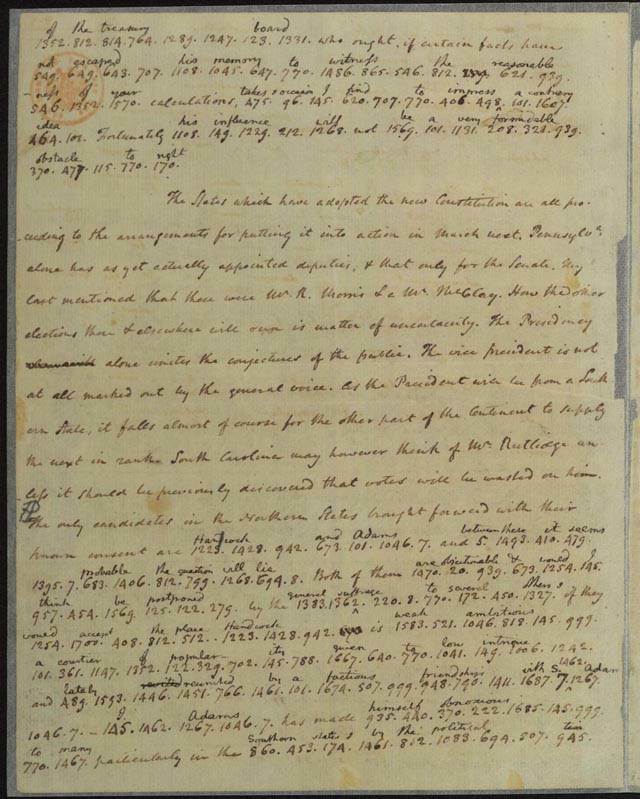 This is a picture of Delaware's copy. New Jersey became the first state to ratify the Bill of Rights on November 20, 1789. 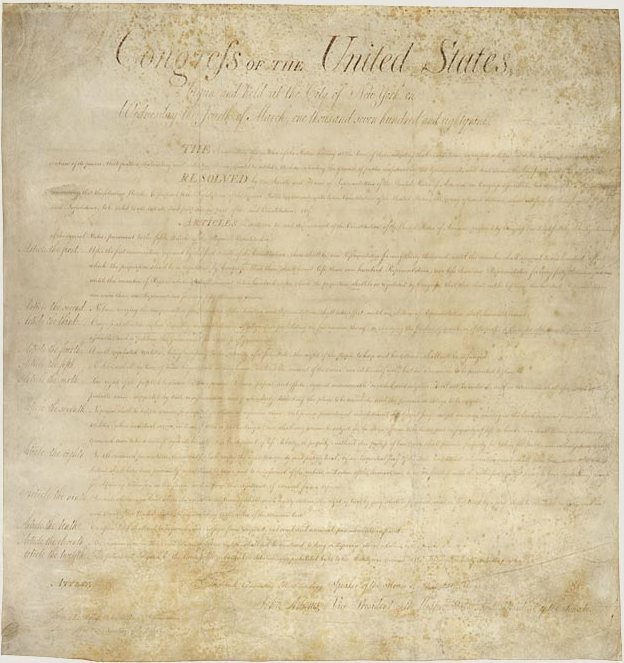 This is a picture of New Jersey's original copy of the Bill of Rights. This copy of the Bill of Rights is called the Beckley Copy. John Beckley was the Clerk of the House of Representatives whose signature appeared on the original documents. 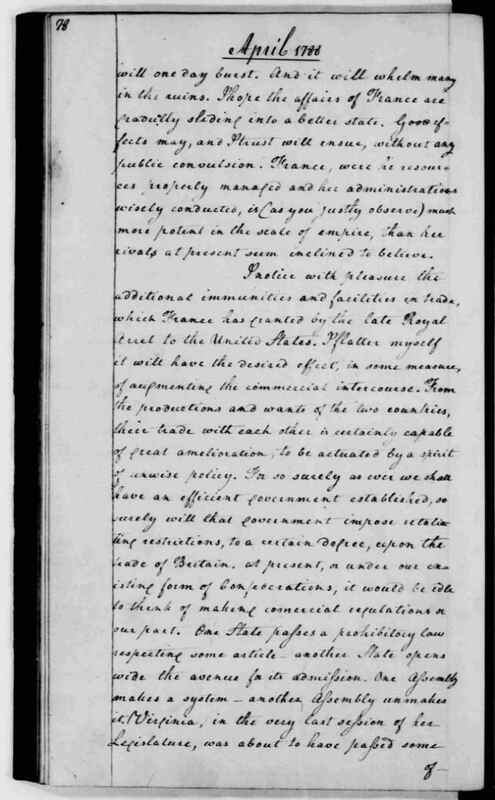 This copy is housed by the National Archives in Washington DC. It is not known to which state this copy belonged. The original documents from four states are unaccounted for, those from Georgia, Maryland, New York and Pennsylvania. The Beckley Copy and one in a New York library both exist, but which states they are from is unknown. Two copies are believed to have been burned. Read the Twelve Amendments proposed by Congress here.